Band of Brothers author Stephen Ambrose, used to refer to the Second World War as, "the good war". As the war that shaped my generations perception of such events it certainly appeared to be the embodiment of good triumphing over evil. Similarly the Korean War, however historians might look at it in the longer view, was perceived to be the forces of democracy against the evils of totalitarianism. So when E.C. 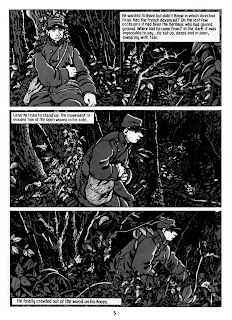 editor, writer and artist extraordinaire, Harvey Kurtzman stepped outside the accepted conventions of writing stories set against the backdrop of the then current and unfolding Korean War or recent Second World War and obliged his audience to think about people and soldiers in particular as the victims of war, the ideas he advanced were always in the context of a necessary evil for a better tomorrow. 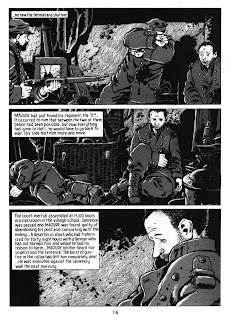 The First World War did fall within the parameters of Kurtzman's editorial gaze, but aside from Woody's "Old Soldiers", the stories that appeared in "Two Fisted Tales" and "Frontline Combat" and largely delineated by aeronautical maestro George Evans, were stories of daring do set in the skies way above the ravaged landscapes of northern France - they were sanitized and romanticised in comparison to what was going on way down below. 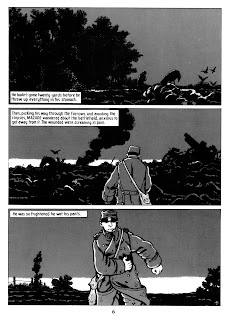 In much the same way the First World War was passed over by the U.K's pocket libraries, who considered it as much too static and too grim to deal with outside of the exploits of flying ace Dogfight Dixon, until in 1979 writer Pat Mills and artist Joe Colquohon created the story of the semi-literate Charley Bourne and cast him into the trenches of war torn Flanders and created "Charley's War " a comics masterpiece. But the truth was that the First World War was by and large just too grim and depressing for anyone to really want to tackle. It wasn't a good war, it was the might, greed and self interest of wealthy industrialists and bankers (sound familiar? ), spurred on by corrupt politicians (sound familiar?) and facilitated by a military elite barely able to comprehend the consequences of the new warfare they were about to lead their armies into, with the fading hegemony of once great empires as the catalyst to the ensuing horror. Not a good war by any means. 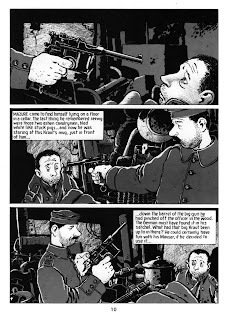 It is this war that has fascinated and obsessed Jacques Tardi for much of his life. 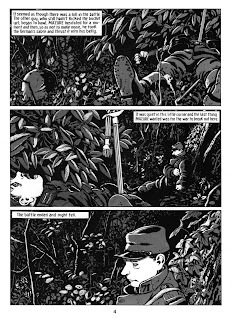 Born shortly after the Second World War and raised as a French citizen in a part of Germany ceded to France after the end of that conflict, he was fascinated and horrified by the stories that his grandfather told him about life in the trenches. 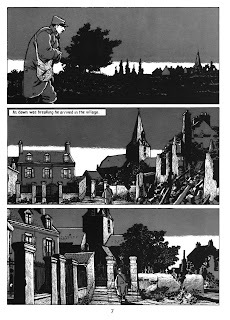 Tardi's work which is distinguished by an unstinting attention to locale and detail, captures the true horror of war in a way that no other artist has been quite able to achieve. As with the story that you are about to read there is a look of utter hopelessness in the eyes of the protagonists, this isn't about war with either Frenchman or German as the victor or the vanquished, it's the story of the little man, the man that keeps his nose to the grindstone, the man that does what his betters tell him to do, the man that plays the game according to the rules formulated by the system, the establishment, the men in suits. This is the story of man against the system, with the system as the ultimate winner. 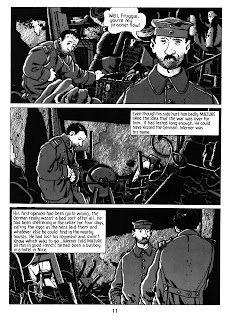 The whole of Jacques Tardi's epic It Was the War of the Trenches will be published by Fantagraphics Books on April 20th. Fantastic. 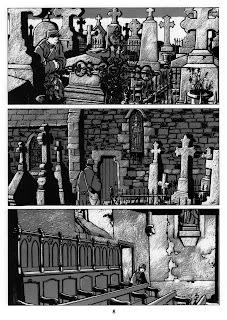 Especially that panel from behind of them both looking out of the cellar window at the hussars. I'll be getting the complete book to go alongside my Charley's War volumes. And notice Dave, that it's those panoramic panels that you love. 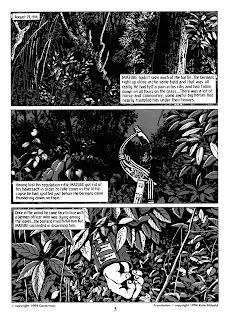 They pretty much set the layouts for the whole book bar the opening chapters, giving the whole work a really cinematic feel. And yes like you, I really hooked onto the panel of them both looking out of the window, it really captures their vulnerability, not to mention the look on their faces in the panel below. 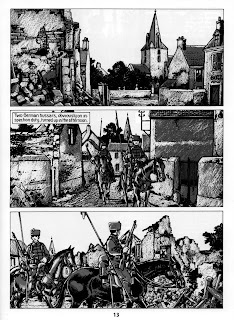 Fantastic stuff Peter, I picked up a couple of broad sheet newspaper Tardi comics in France last year one was 1916 I think there is one for every year of the war, that and a new Nestor Burma story, both really excellent and really work in that format. 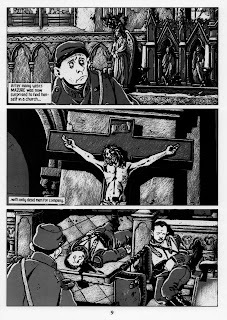 Yes, I think I know the ones you mean James; "Putain De Guerre", which were published as newspaper comics and have now been collected into two volumes and again Tardi doesn't pull his punches with some truly hideous pictures of reconstructed facial injuries, which are just too disturbing to dwell on for too long. You can see some of the photos he used as reference for those drawings on his drawing table in the video clip. 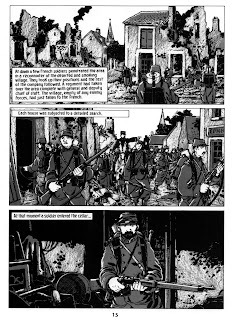 The artwork he's working on again appeared in "Putain De Guerre". Thanks for that info James, I'll see if I can flag it up nearer the time. 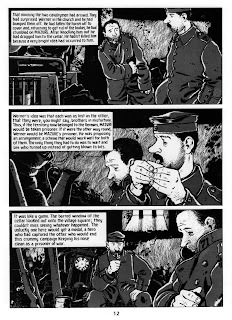 It's good to hear that Fantagraphics are planning an edition of Tardi's magnificent magnum opus. I first became aware of it a couple of years ago when I visited the memorial to the dead of the Somme at Thiepval with its huge, gloomy Luytens monument. The information centre had numerous copies for sale in other European languages but I was sad to see there were none in English. 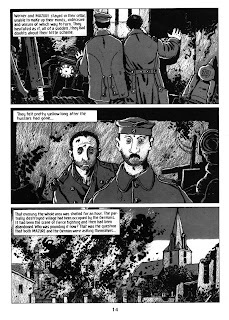 To my mind works like this and Charley's War are a superb educational resource and should be made essential reading for all schoolchildren. Who knows - if something similar had been available during the 1920s and 1930s we might still be referring to the First World War as the War to end All Wars...! Hi Phil, yes I'd definitely put this book up the with Erich Maria Remarque's "All Quiet on the Western Front". As well as Lewis Milestone's incredible adaption of the novel. 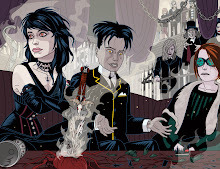 There's several exciting new European graphic novels hitting the shelves this year including a couple of collections of Sanchez Abulet and Jordi Bernet's "Torpedo", more about them shortly. "By George!" - It's Dave Morris's Birthday!!! Septimus Scott - The Septugenarian Swashbuckler.